Surfing the internet we have come across other groups that have made commemorative quilts and found information on quilts that were made during WW1. “How lovely to hear from you. I looked at your link and really like the idea of local shops exhibiting your work. 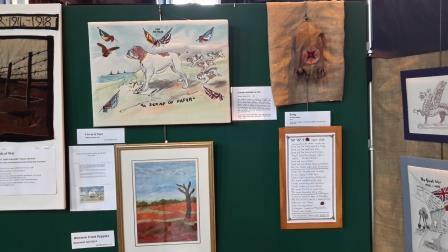 We have had a few pop up exhibitions in shops and always got good feedback. We have nearly 100 textiles now, the number varies since they are all on loan and occasionally go back for other exhibitions – or simply for family occasions. 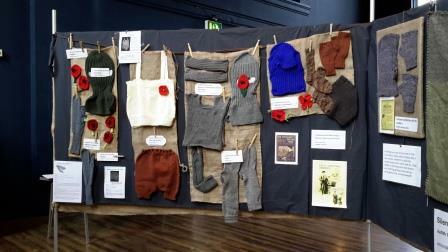 I’ve attached a few new textile images – and included the knitted display (from original patterns) since knitting was so important to the troops during the Great War and because the knitted knickers and vest (probably VAD) always interests visitors. Also, a Family History Community Quilt Project to commemorate those who served with the Commonwealth forces during the First World War and who did not return home. 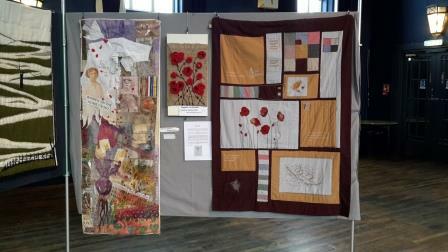 London Quilters library of WW1 quilts can be viewed here. A rare collection of WW1 qults were exhibited in at The National Quilt Museum in Paducah, Kentucky, in February 2016. And finally, just days after the United States entered World War I (1914-1918), President Woodrow Wilson issued a proclamation to the American people titled, “Do Your Bit for America.” Women did their bit in many ways, one of which was to make quilts and “save the blankets for our boys over there,” as one slogan put it. The Changi quilt might look like an innocent craft project – but its patchwork squares tell a different story. 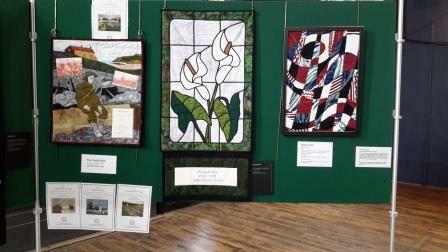 It was created by a defiant group of women prisoners during the Second World War. Each square is packed with secret messages and hidden meanings.